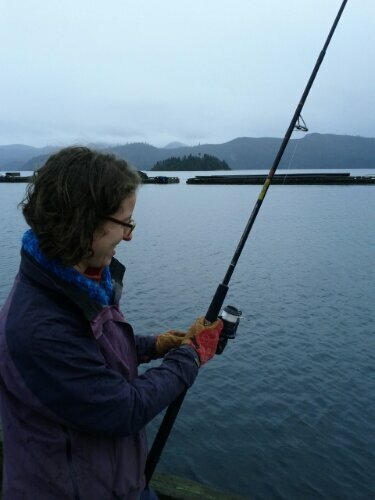 This afternoon Tess and I went fishing off the government wharf in Queen Charlotte. Her dad generously outfitted us with a casting rod and a trolling rod before we left Vancouver. He also supplied a tackle box with myriad gear. The wharf is a good place for casting so we had planned to trade off with that rod. Shortly after we arrived a fisherman named Pat wandered over to say hello. When he saw we were sharing a rod he quickly went and fetched his and lent it to Tess. After a short lesson he walked off to do other things. Tess was soon casting far further than I. Her marksmanship took a little longer to refine. The end landing spot was typically within 90 degrees of her target. 90 degrees either side. Only once did the lure end up inside Pat’s boat. In the end she nailed it and her casts were distant and true. 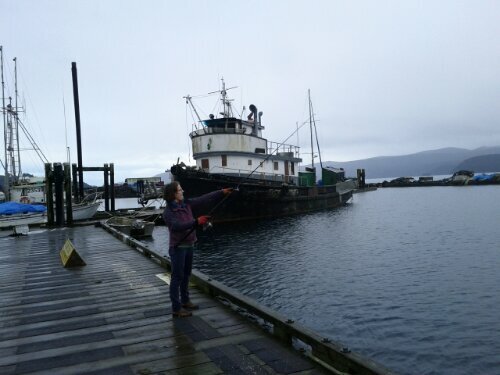 This entry was posted in Haida Gwaii and tagged fishing, Queen Charlotte, Tess. Bookmark the permalink. nice, nice, vay nice! The point isn’t to catch a fish, is it? No! It’s probably to catch a fishing boat! And I nailed it.